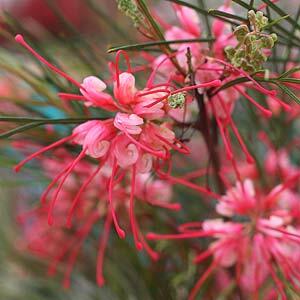 Australian Native flowering plants are a fascinating and varied group. While well known Australian Native flowers include flowering plants such as banksia, Waratah and Kangaroo Paw the untaped beauty of Australian Native plants is only fully recognised by a few specialist Nurseries, seed Suppliers and Australian Native Flowering plant Mail Order Nurseries. With such diversity in flower colour and form it is little wonder that Australian Native Flowers are now being exported world wide. The intricate flowers of the Grevillea longistyla (pictured right) are but one example of the many Australian Native Flowers that have incredible value both in the garden and as cut or dried flowers. As early as the 1800s, many species were sought after in Europe for the colourful flowers and as cultivation and propagation techniques improve many more will make their way to the world stage. Some of the more popular Flowering AustralianNative Plants such as Pimelias, Phebalium, Lechenaultia, Rhodanthe, Darwinias, Chorizemas, Verticordia, Grevillea, Eremophila and Isopogon have such attractive and fascinating flowers that they are quickly becoming recognised as having great commercial value as cut flowers to the Australian Native Flower Industry. A HAVEN FOR PLANTS – phone (03) 53822397 402 Old Hamilton Road Haven, Victoria 3401 Mail order Australian Native Tubestock . KANGET NATIVE NURSERY – phone (02) 65535561 929 Gloucester Rd Wingham NSW 2429 Native Orchids & Hybrids, Staghorns and Elkhorns. BUSHLAND FLORA (Native seed specialists) – phone (08) 95611636 17 Trotman Crescent Yanchep WA 6053 Seeds only of Rare and Unusual Australian and Western Australian Species. Smoke Seed GerminatorWA Plant Books available. AUSTRALIAN WILDFLOWER SEEDS Pty Ltd – phone 08 94706996 Fax 08 94706999 PO Box 3139 Carlisle South WA 6101 Australian Wildflower Seeds Presentation Range 35 varieties.